I wish you could get this in audio format with the ‘big brother’ guy reading it out… Would it make it more interesting?! So to finish of last night, the gite in Le Soulie was idyllic, I could imagine living there very happily. I was wrong however about the German couple, Rhinan (forgive the spelling, but it sounds like his name) was German but his partner Sylvia was French! Our meal was good and hearty, and despite a little rain outside, the wood burner kept us nicely warm. After dinner we took to the Chapelle they had created and instead of readings & prayers we took it in turns to say what we felt or why we were on the ‘way’. Kind of like a rehab clinic but without the drug abuse… To be fair it was a fairly touching experience. As usual I had all these beautifully poetic comments in my head, like ‘life is a journey’ etc etc, but when it came to my turn I just did my UNICEF spiel…. Meh…! If only brain to mouth function worked correctly. We had all looked forward to a clear night so we could see the stars but with the rain had come the clouds so we all retired to bed. I was using my sleeping bag for the first time, after the water leak in the morning. Within an hour I was sweating, I could sleep in a blizzard on Everest in this! Zip open and sleep. So now, day nine, not in the big brother house. Today I don’t want to get out of bed, I woke at six but don’t get up until close to seven. Today I even have breakfast, tea, cake (yes cake, it’s a French thing), and dry bread with nutella. Back to the room to pack, I inspect my feet, hmmm ‘nother blister, nothing major though. I brush, talc and drop the… (sorry to much information). And I’m off. It’s only 15km to Conques and I’m meeting ma & pa for lunch, I’m excited to see them and kind of nervous that it’ll make me want to stop. It’s a tough 15km, first down into Espeyrac and then up the other side of the valley. A nice break as we followed the ridge line along for a while, I just wish it wasn’t so hazy out. Finally we start decending into Conques. It’s near vertical, one false move, and I’d be arriving head first with pilgrims scattering each and every way! Not to mention the pressure it puts on my feet. 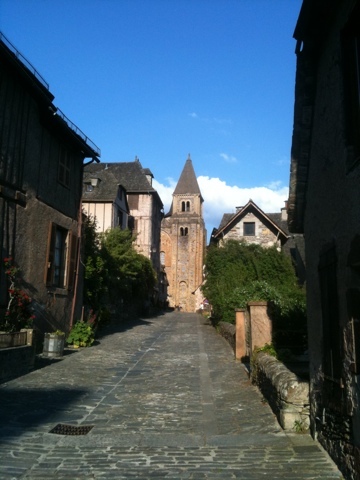 Finally Marcus and I arrive at the top of Conques, it’s not what I remember. As we make our way down to the abbey, I begin to recognise it. Such a beautiful little place with such remarkable history. We meet Thomas, another German who had stayed with us last night. Before long he had departed, it was only midday after all. Soon to follow him was Marcus. Just as Marcus said his goodbyes the folks walked round the corner. It was lovely to see them and I’m sure they were glad to see I was still in one piece! After a mediocre lunch, which although was crap value for money, was probably a very healthy option for me, (thanks pa)! We wandered around the abbey to find the pilgrims hostel, I got myself a bed and bumped into Annette and some other pilgrims I’d crossed paths with. After dumping all my gear, we walked around the village before they left to get home. Dad saying it was a two hour journey, it was an hour alone to Figeac, at which I responded ‘it would take me two days’!?! I’m chuffed I’ve done just over 200km, don’t work it out in miles, it doesn’t sound anywhere near as good! This evening I have sat outside the abbey reading ‘The Way of Zen’, just to throw everyone, and now as I write this I’m lying in my bed, in a dorm of 14 but everyone else is at dinner.